Many claim this, but of course it does not - so our Hornet body armour (below) is now available in small, regular or large sizes. With our other armours, the careful design of adjustable straps and fixings can allow a wide range of sizes to be covered with a single "regular" size. This makes sense to the manufacturer and helps to keeps production costs down. It also makes sense for the purchaser, who avoids having to measure the deminers and order a range of sizes. If this were not the case, demining groups might have to buy new PPE every time there was a staff turnover. 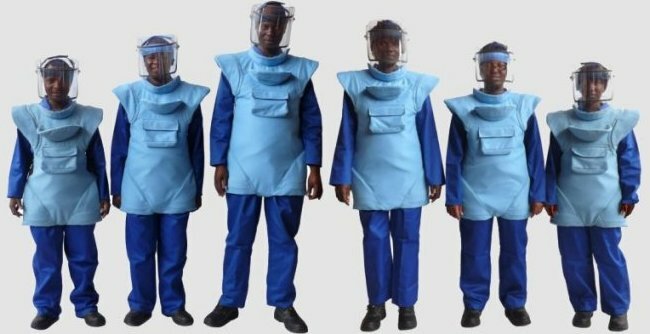 Our "regular" demining PPE is designed to be adjusted to fit the average range of sizes. To give us confidence that this will almost always be true, we try our products on selected staff as a test. The smallest staff member is 1.56 metres, the next a fairly average 1.72 metres and the last is an unusually tall 1.91 metres. 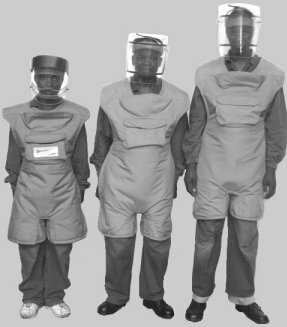 The photograph alongside shows the three staff wearing the same armour, illustrating how it is designed to fit a wide range of heights. That said, all of our armour can now be ordered in "regular", "Large" or "Extra-Large" sizes. Contact us with your needs. In the unlikely event that our Regular, Large and Extra-Large sizes do not work for you, we will always try to accommodate you. Unfortunately, when this means using special templates and guides there may be a cost penalty. Ask us and we will try to meet your needs as economically as possible. Our Standard visor head-frame has been very popular and successful, but it can prove unstable or uncomfortable on some heads. To overcome this, we have introduced the Comfort® head-frame and the new Platinum visor, Half-visor and Mask-visor - combinations that allows for extra width and the cranial lumps and bumps that many of us have. One size does not fit all - but it can come close!